The SEC produced a handful of the nation's top teams this season. Heading into the conference tournament, the SEC currently has three teams ranked in the top-10 – No. 5 Tennessee, No. 6 Kentucky and No. 10 LSU. Kentucky has won the last four conference tournaments, but this season the Wildcats have some serious competition at the top. They lost to LSU at home and split its two games against Tennessee. LSU hasn't won this tournament since 1980 and Tennessee hasn't won since 1979. 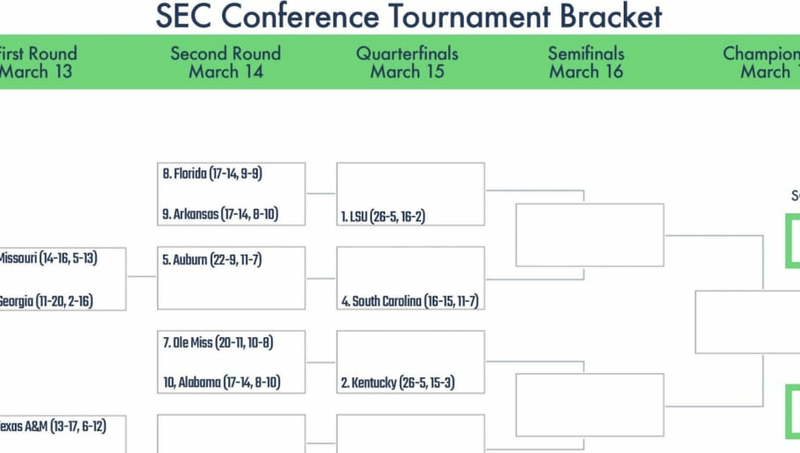 This Wednesday marks the start of the 2019 SEC Tournament, which runs from March 13-17. The printable bracket can be found here as a PDF as well as in the tweet below. Tune in to find out if LSU can back up its regular-season title and get a conference tournament win or if the Kentucky Wildcats can recapture their success from past years. For the printable ACC Tournament bracket, click here. For the printable Big Ten tournament bracket, click here.